From the highest mountain of the Andes, the deep Amazon jungle and Latin America’s loudest cities, comes the explosive sound of Falakumbe. 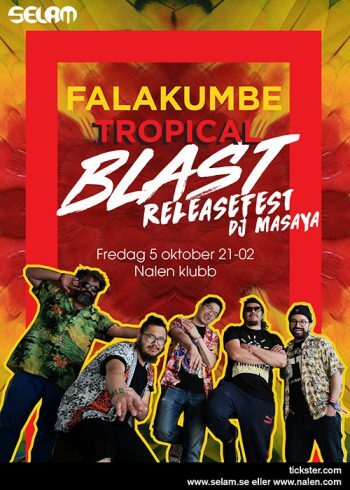 Cumbia-reggae chicha-punk mixed in a tropical casserole of distorted guitars and güiro that melts the stage and the audience together into a one big pachanga. Falakumbe’s sound has been compared to Gogol Bordello in its gypsy-punk approach but it’s definitely each member’s own bag of roots and music from their hometowns that has given the band it’s particular style. For instance the underground reggae and hip-hop from Santiago’s periphery and the characteristic psychedelic sound of Huancayo’s early 80s chicha wave. Falakumbe rides on the latest cumbia wave from Latin America in which bands like Chico Trujillo, Kumbia Queers and Celso Piña among others has influenced the latino scene around Europe.